Flowing through the heart of Zion National Park, the Virgin River is the life force that helps carve out the wondrous landscape. While there are many exciting hikes in the main canyon that take you up to stunning viewpoints or lush oases, sometimes it's fun to just wander around aimlessly along the banks of the Virgin River to enjoy the sound of the water in the open canyon. The hikes described here don't really have a goal or destination--perfect for anybody looking for a relaxing stroll. One of the most welcoming spots for river access is at Canyon Junction (the 3rd stop on the Zion Canyon Shuttle, just after the Visitor Center and Zion Museum stops). At the Canyon Junction stop, walk up the road a bit and look for the "River Access" sign and steps that go down to the river. There are several good spots to relax by the water and it's fun to hike up the river a bit and explore along the banks. Another friendly spot for river access is at Weeping Rock (the 7th stop on the Zion Canyon Shuttle); look west from the shuttle stop and follow the short trail down to the river. The banks of the river are usually sprinkled with datura flowers--beautiful white flowers that bloom at night, but they are also poisonous, so let them be. 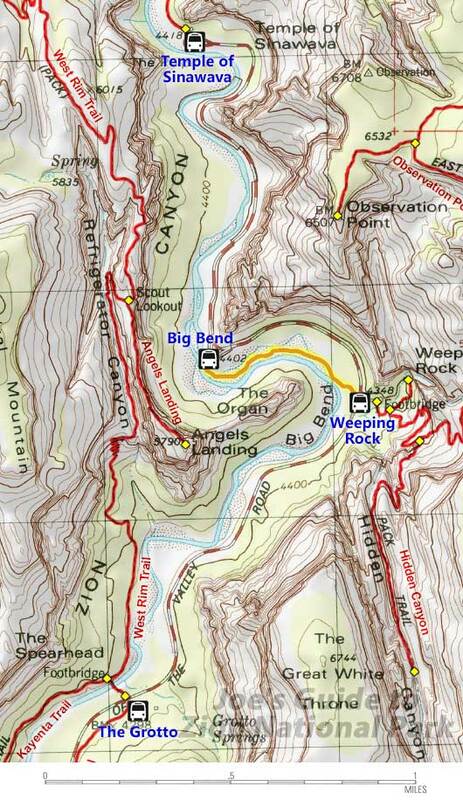 After wandering around, you can return to Weeping Rock or continue hiking along the riverbank or trails-of-use all the way to Big Bend. 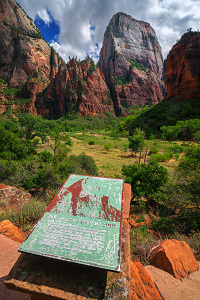 One random landmark close to Big Bend is an old roadside plaque dedicated to the Great White Throne; this spot offers a great view of the Great White Throne with the Organ under Angels Landing in the foreground to the right and Cable Mountain to the left. It is possible to hike along the banks of the river at just about any other spot in Zion Canyon, including Court of the Patriarchs to the Zion Lodge (although the trail is used by horseback riding groups that may make this less appealing) and the Grotto to Weeping Rock (which offers good views of Angels Landing but involves several stream crossings since there isn't much of a trail). Wherever you wander, please follow the "Leave No Trace" principles and obey any "Restoration Area--Keep Off!" signs. This may seem obvious to most but it's important to remember: do not enter the river during high water conditions like spring runoff or during or after a rainstorm. 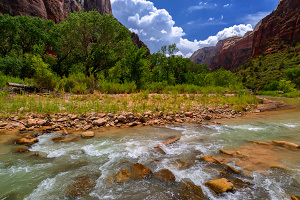 While the Virgin River is typically mild-mannered and friendly, conditions can change to deadly in a matter of moments. Wandering around the banks of the Virgin River is a pleasant pastime for those who want a leisurely stroll instead of a long hike. Conditions can greatly affect the enjoyability; wandering around in the open is much more fun on a cooler or cloudy day (or at sunrise or sunset) vs. noon on a 110-degree sunny day.